They say happiness starts at home, which is why Mill View Memory Care offers comfortable living spaces with inviting finishes and modern essentials. Residents are welcome to choose between our private and shared suites, based on their own preferences and needs. 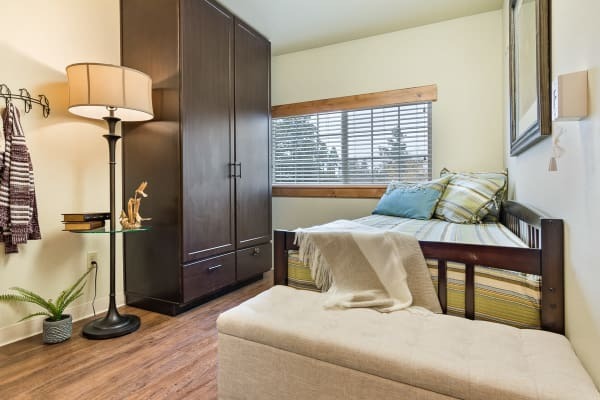 Our single-occupancy apartments for seniors with memory loss measure 118 square feet and include a wardrobe for storage and a washing sink. Shared suites offer 165 square feet of living space, two beds, and two wardrobes. No matter which floor plan is right for you, you will have access to a full menu of community amenities and services designed to enhance your everyday living experience. Each floor plan at Mill View Memory Care offers a large picture window with views of the surrounding community, with its inviting courtyard and beautiful trees. Our Memory Care suites also include air conditioning, as well as warm, wood-style flooring and privacy blinds. It’s all part of creating a soothing place to call home for seniors living with memory loss. Come for a tour today to view each of our floor plans in person. Our friendly team is here to answer your questions and provide a personalized tour of our community.